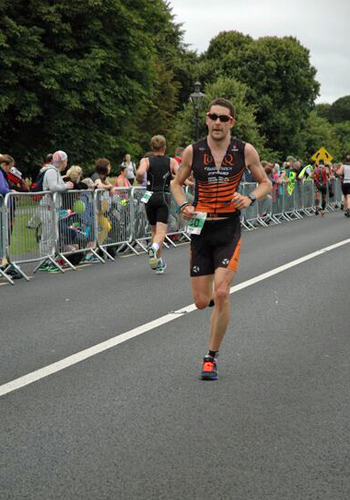 I picked out IM Dublin 70.3 when it first got launched as a good opportunity to do a relatively local race in a city I knew well – from the days when I worked for an Irish company. The event was at the beginning of August and fell just 3 weeks before the World Champs, so was great as a warm up race for my big goal in Austria. The plan was to try and have a solid race without killing myself and end up needing lots of recovery time afterwards – try telling anyone that’s remotely competitive to rein it in!!! The weekend didn’t get off to the best start when we arrived at the hire car place at the airport, to realise I had booked a car for the month later on one of the busiest weekends of the year! After having to go to another company and forking out a lot more than I originally had paid, I finally had a car to get us around over the weekend, a suitably sized VW Polo! Saturday was all about getting the admin done, the usual racking of your bike in one location with your T1 place, drive to the other end of the city to put your trainers in T2 etc, etc. We did get an opportunity to swim on the course so I went for a paddle. Back at home all the local lakes had warmed up quite nicely and I was accustomed to swimming in around 20 degrees, the Irish Sea on the other hand was a brisk 13! 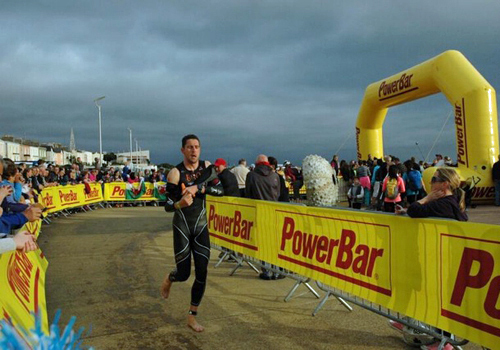 So I didn’t stay in too long but checked out the course, got my sighting marks and got a feel for sea swimming again. I bumped into a friend, Stephen Skates, who I didn’t realise was racing. 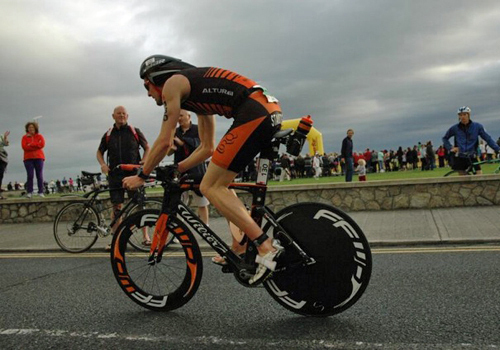 Stephen was in my Age Group and a very good athlete, having won the Age Group race overall at UK 70.3 in 2014, come 7th in the World 70.3 Champs last year (ahead of me) and recently, a podium finish at one of the most competitive races on the circuit, The California 70.3. All of a sudden, my plan for “a solid race” had gone out the window. Race day on Sunday morning arrived and the Pro Men were off at 6.50am, followed by the Pro Women, then the 35-39’s were the first of the Age Group waves to go at 7.00. Quite quickly, I found myself swimming on my own at the front and heading towards the 1st buoy. It was a bit choppy; it felt like there was a current pulling me to one side and it seemed to take ages to reach the buoy, but I ploughed on, knowing I needed to maximise my swim strength. The swim felt it had taken a bit longer than usual (which was confirmed when I got out in around 28:30), but I had a decent lead and headed to the bike. The bike course headed into the city, out the other side past transition 2 at Phoenix Park and then on for another 20 miles or so before heading back. The route is flat, but mainly country lanes and the first 30 miles felt like they were into a headwind and it was raining. Apart from a few Pro Women that I passed, Fraser Cartmell (who had had an accident), and another Pro that I caught at 80k, I saw nobody, so had no idea of what is going on behind. I finished in 4hours 14mins and had splits of 28 mins for the 1.9k sea swim, 2hours 20mins for the 90k bike and 1hour 20mins for the run. It’s probably my best executed half ironman and I am delighted. As it happens, coming off the pace for those last few miles had cost me 5th place overall with the Pros, but it doesn’t matter. I won the Age Group Race overall and came 7th and got my slot for the World Champs for 2016 on the Sunshine Coast, Australia – a destination I am very excited about! So 3 weeks to go to the World Champs, and my final race of 2015, this race has given me the confidence I can be right in the mix come race day in Zell am See…..